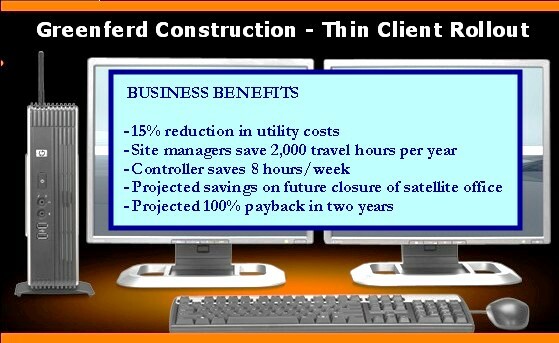 Greenferd Construction’s “thin client” diet is helping the firm shed a lot of girth: excessive utility costs, thousands of travel hours, not to mention the inordinate amount of time devoted to IT management. All those are but unpleasant memories. When this Toronto-based construction management firm resolved to opt for thin client systems, the drivers were decidedly business related. Greenferd Construction Inc., which specializes in commercial interior projects, experienced dramatic growth following the construction boom in the earlier part of this decade. As the company’s operations expanded so did its headcount — and the complexity of its IT requirements. “It got to a point where we had so many users, it was difficult to disseminate information at the right time to meet their requirements,” said Greenferd Controller Heather McKelvie. To respond to these challenges, in 2008, Greenferd moved its data and applications to a data centre run by Burnaby, B.C.-based telecom firm Telus. Greenferd also equipped its office staff and with HP Compaq t5730 thin client computers, rolled out with the assistance of HP reseller ThinDesk Inc. in Markham, Ont. The transition, the company says, has brought many benefits. They include huge time and cost savings, business continuity, greater security, and staff being able to focus on tasks that add greater value to the business. The last benefit is something McKelvie can personally testify to. While she is Greenferd’s Controller, in the past necessity required her to double up as IT administrator and help desk manager. Ongoing involvement with routine IT-related tasks – break fixes, offsite backups, software patches and updates, managing user requirements et al – didn’t leave much time at all for higher-level tasks. Today, McKelvie has her wish with Greenferd’s new set up: Telus managing the company’s data and applications — which reside on HP ProLiant DL585 servers at the Telus data centre — and ThinDesk handling help desk calls. The day or so per week freed up for her since the transition to a thin client architecture also allows the Greenferd Controller to infuse greater balance into her life. According to McKelvie, the new system also resolves the IT managers conundrum – how to combine easy information access with foolproof security. By contrast, she says, if a thin client disappears, no real harm is done, as there’s no data on these machines. It all resides at the Telus data centre. At the centre, data is backed up daily and replicated both within the Toronto facility and a data centre in Calgary. This also works very well from a business continuity perspective, McKelvie suggested. In bygone days, Greenferd’s business operations suffered when its systems became infected with malware or data backups failed. Now with Telus managing the firm’s servers, McKelvie says business interruptions are a thing of the past. Later this month, the firm will also provide its site managers with HP 6720t mobile thin client laptops, equipped with AirCard, and wireless printers. AirCard – a device from Richmond, B.C.-based Sierra Wireless – would enable the laptops to connect wirelessly to a wide area network. Greenferd Construction expects the HP mobile thin clients, with the AirCard and wireless printer, will boost productivity of the nine site managers, enabling them to accomplish far more that they ever could with their BlackBerry smart phones. In 2008, the firm purchased these BlackBerrys to improve the site managers’ communication with project managers and others. However, while the devices did enable site managers to view e-mail in the field, they did not offer site managers all the functionality they needed to do their job. (The firm did consider giving each manager a standard laptop, but eventually decided not to because of potential network security breaches and the risk to critical data if the laptop were lost or damaged at the construction site). So up until now, to download and print large email attachments site managers have had to spend at least an hour travelling to a satellite office. The facility’s sole purpose is to support these functions. Documents e-mailed to site managers need to be available on location pretty quickly, noted Don Brown, Greenferd’s partner in charge of production. But equipped with mobile thin clients and wireless printers, site managers will soon be able to directly access the files they need, while they are onsite or at client locations. “Removing the time delay in [accessing] current information will be a tremendous asset for us,” Brown says. In fact, once site managers get into the groove with their new mobile thin clients, Greenferd may shut down its satellite office. Rent avoided would supplement what the firm is already saving on utility costs, by no longer running its servers and desktops inhouse. Greenferd estimates a two-year payback on its thin client rollout. McKelvie also sees the fixed per-user cost (guaranteed to stay the same for three years by the firm’s contract with ThinDesk) as a significant benefit. Experts say we’re soon going to witness a rapid adoption of thin clients, with these machines replacing corporate PCs in companies across many sectors. They cite a bunch of reasons for this. These include: the advent of virtual PCs that can run all the software users need; and the fact that thin clients are now equipped with the same industry-standard connectors (such as USB) as PCs. What’s more, a thin client – complete with its server and associated components — uses less than half the energy of a PC (according to Bremen, Germany-based Fraunhofer Institute).